Bendy wire mini tripod with 1/4 inch screw thread. Made from flexible metal and durable plastic. Features 3 adjustable legs. Can be placed standing on tables, shelves, walls or ground. Whether you’re taking a shot of you and your friends whilst camping or lining up the next landscape whilst walking, you’ll be happy you have this handy little tripod close at hand. Completely flexible and versatile, it simply & securely fastens to your camera in seconds. Incredibly lightweight, this comes in a handy pocket-size for added convenience. Includes a clip-on feature so you can attach the tripod to your belt or pocket for added portability. 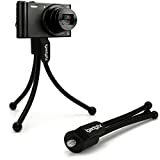 This entry was posted in Discount Photography and tagged Black, Cameras, Clip, Compact, Digital, Flexible, iGadgitz, Mini, Nikon, Pocket, Point, Shoot, Small, Table, Tripod by Ball Photo. Bookmark the permalink.